Dive sites of the Pacific Northwest. 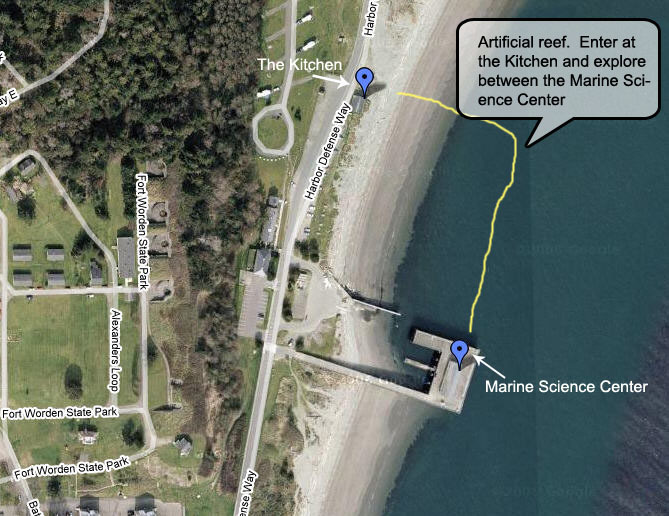 Port Townsend area have some of the finest diving in the Puget Sound area. For more information stop by the dive shop or give us a call. Octopus Gardens Dive Shop always has free hot beverages and rinse for you at the shop. If you are new to diving our local dives, we offer of certified divemasters to guide your dive. $69 for one dive, up to two divers. 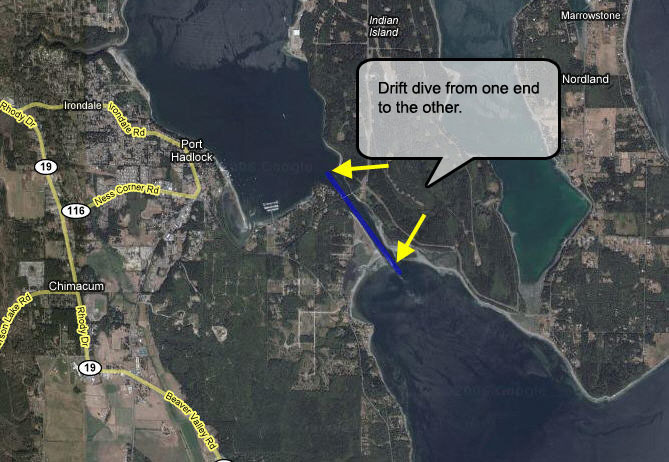 One of our favorite dive sites…drive north through Port Townsend to the end. You will see a Northwest Maritime Center on your right. You can unload your gear here and park on the street. Watch the current! Call the shop for best dive times. Stop to meditate in the cathedral of metridium. There are always interesting things to see – nudibranchs, octopus, anemones, fish and more. MAP UPDATE: The rope from the cathedral to the rocks is not currenly in place. We have also discovered quite a few logs with GPO dens. 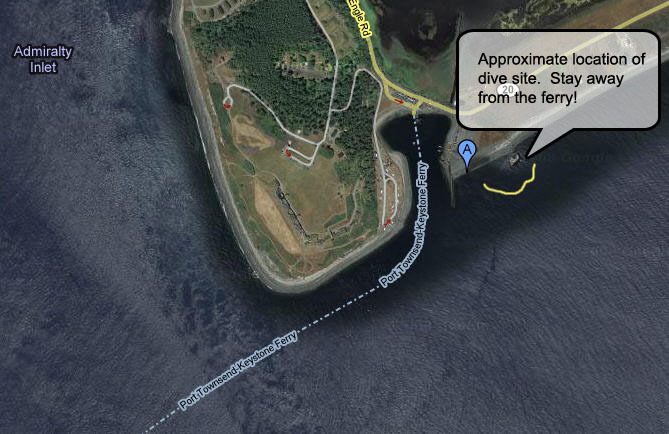 The logs are located between 45fsw and 75fsw on a path from the end of the T-Dock and the log pile on the map. This dive site is at Boat Haven Marina in front of our old location. The wooden hulled Ranger is the remains of an 80′ work boat. It is covered with macro life and great for shallow water photography. It is best at high tide because there is less of a walk out the long shallow beach. It is simple to find. 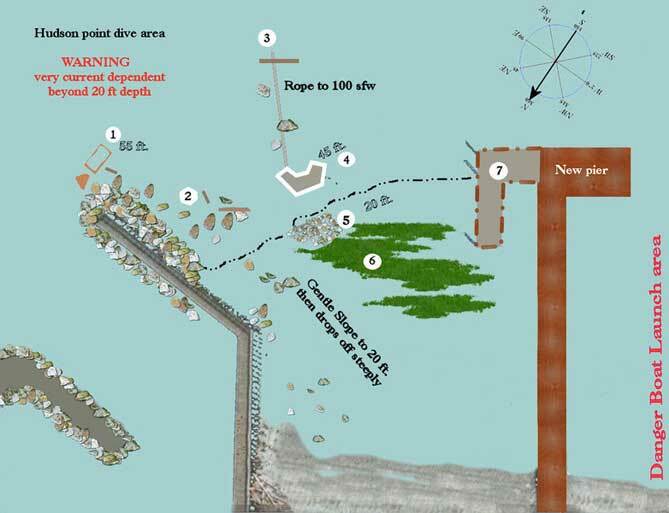 There is guide line from the exposed piling at the corner of the breakwater which encloses the Boat Haven Marina. This line leads to bow of the Ranger. Max depth 40fsw. There is a complete underwater park from the kitchen annex to the marine science center. You will find old pilings and concrete blocks with abundant sea life including octopus. Average depth is 35 to 45 ft. The site has currents that can change frequently. You can drift towards the PTMSC pier or dive under it for protection from the current. 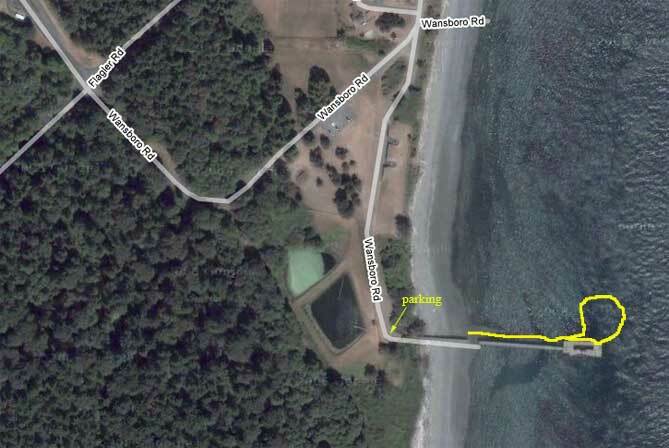 The the park amenities, this makes a great 2 dive site with plenty of picnic room for the nondiving friends and family. MAP NOTE: There are now morring buoys along the yellow line. The buoy nearly straight out from the Kitchen House has nice pilings with life at the bottom of that buoy line. This site is very current dependent and is only safe during long slacks at times of a low exchange. There is a long stairway to the beach. The PIER HAS BEEN REMOVED. You should be able to still find the remains to guide you out to the slope. Reefs are left, off and out from pier. Rope to reefs (laying on bottom). There are a network of ropes. Reefs are in 40 to 50 fsw. A barge load of turn of century plumbing off the pier. We find large rockfish and sea pens. Many have mistaken Point Whitney for a blah dive site, but this site is very rich and has something for every diver. There is depth for advanced divers. New divers will like the easy entry, straight out and in navigation, and no currents. There are lots of critters in the shallows. The pipeline houses GPO’s, rockfish, and a recovering starfish population. At times the visibility and the warm water temperatures in the shallows have made Point Whitney seem like a tropical dive. In August we have seen 40ft visibility and surface waters to 30 feet in the 60’s F.
The site is on the grounds of the Point Whitney Shellfish Labs. There is plenty of parking, a boat ramp and flush toilets (often out of TP). You can dive here at any tide level, however diving near the high tide peaks offer the best visibility. The pipe is the main part of the dive. It is shallow for a long time then slopes steeply to the end. There are some blocks to side at the end of the pipe that have been housing a GPO and 3 large moss headed warbonnets. There are often other octos along the pipe under the concrete dividers. Point Whitney is also great for training and practice dives. The only caution here is that it can get quite crowded with boats during fishing and crabbing seasons. Dive flags are advised. Directions: Over the hill (Mt Walker) from Quilcene. just as you come back down to sea level. Turn on Bee Mill Road (Also signs pointing to the Point Whitney Shellfish Labs). The sign may say closed in winter but this is not the case. As Bee Mill veers to the left go onto Point Whitney Road to the end. 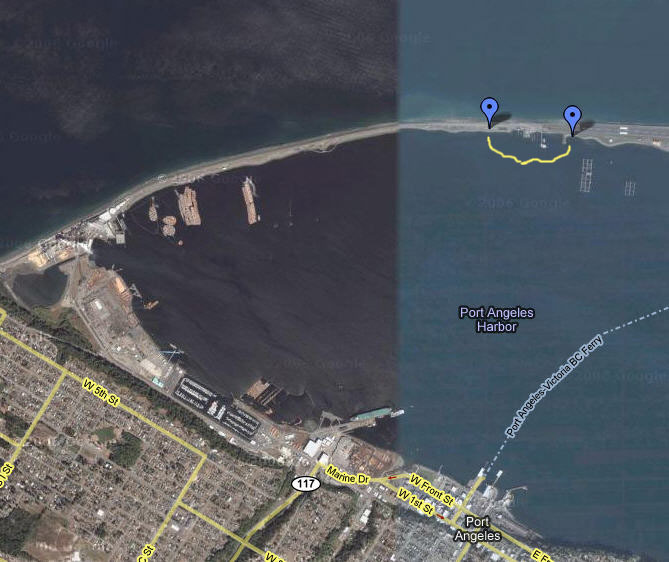 MAP NOTE: The pilings (shown on the bottom right of the map) have been removed. You can still have a good chance of finding the pipe if you enter distinctly east of the pipe (towards the small slab on the map) and then turn west after 18fsw. Swim until you come across the pipes. 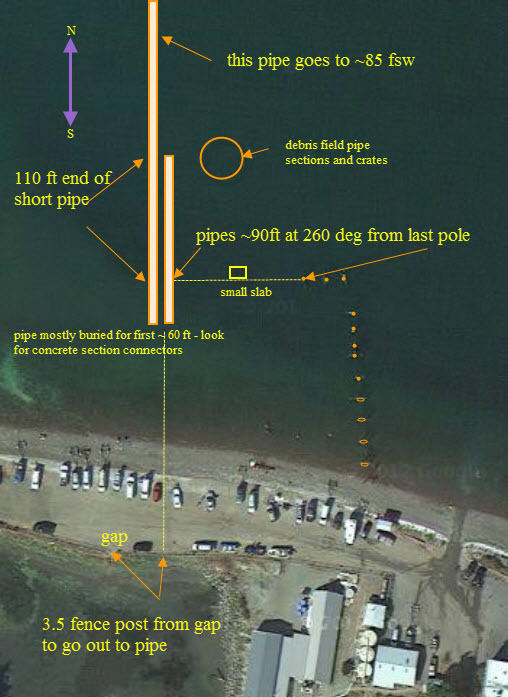 Ed’s Fault (boat dive) is marked by a buoy and starts on a pinnacle at 20 ft that drops to a long ledge that is as deep as 100 ft. Scattered boulders and the top of the ledge is very abundant with sea life. 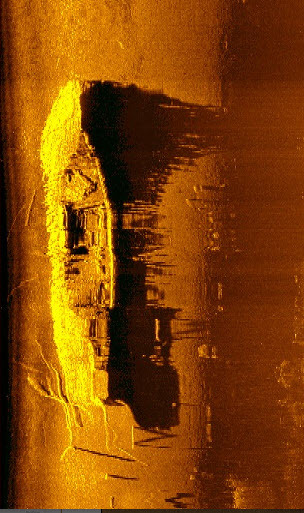 It would take several dives to cover the area. Low to high current but wind from the south can cause anchor to drag . Very good drift dive on an outgoing current. Best done by a live boat but can be done off shore with 2 vehicles. Max depth 35 feet. Keystone State Park is a beautiful dive with tons of sea life along the breakwater. It was rated one of the TOP SEVEN JETTY DIVES IN THE WORLD Current sensitive! Dive on a low exchange day. 50′ max approx. end of breakwater. Lingcod, octo – big and small – dog fish, greenlings, sea anenome, nudibranchs. A diver must stay in the breakwater area and away from the ferry terminal!! The dive in the pilings makes a nice second dive. It’s somewhat protected from current. If flowing just right, you can drift from pilings to the jetty. Again, DO NOT GO IN FERRY LANE! Salt Creek State Park and Campground has a breath taking underwater park with colorful sea life. There are four possible entry points. But we’ve found the middle one to be the easiest. The hike down the steps and the entry is a little tough but worth the effort. Kelp beds and strong surge can make the dive tricky but when you hit the water it’s worth the effort. Currents can vary. Ediz Hook dive area starts at the park and ends at the cellular tower. 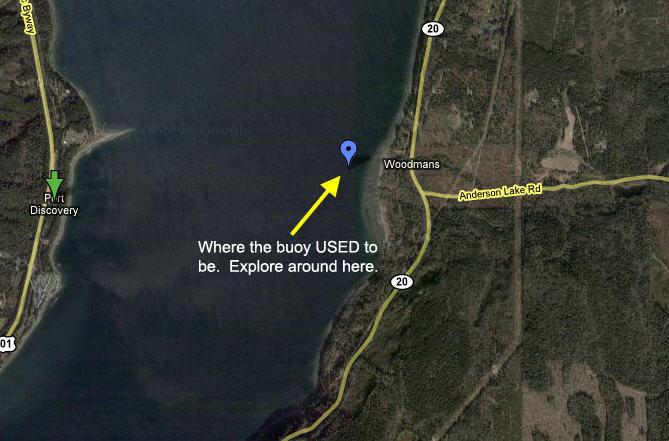 This site has several log jams that have sunk and an abundance of ever changing sea life. Depths can reach to 135 feet in places. Out by the Coast Guard station is a wonderful dive called THE ROCKPILE. Access became limited after 9/11 so it’s now a boat dive only. This rocky reef is loaded with schools of a variety of HUGE rockfish. 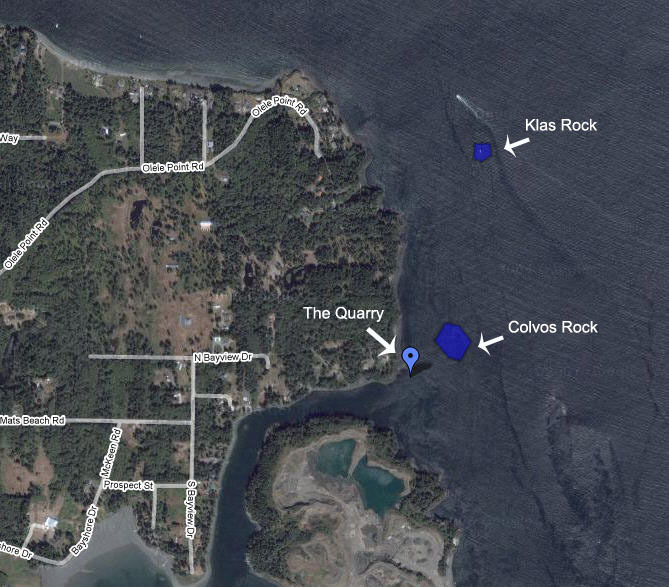 Klas Rock and Colvos Rock are excellent boat dives both live and, when currents allow, anchored. Lots of sea life and always changing. Quarry is an OK dive but not as much life as Colvos. Klas is a little deeper and more of an advanced dive. Colvos Rock – 30-95 feet; Las Rock – 100 feet; Quarry – 35 – 95 feet.